Projections are that the El Paso, Texas, MSA (which includes El Paso and Hudspeth counties) will pass 1 million in 2020. The current population is 923,936, making it the sixth largest MSA in the state. The distance from the state’s largest market, Houston, to El Paso, is 750 miles. (For context, it’s 637 miles from St. Louis to New Orleans.) You can easily traverse the Mississippi quicker than you can drive across Texas — so El Pasoans have created a literary world of their own, befitting a region of almost a million people. On July 5, 2017, the day after Independence Day, El Paso saw a new independent bookstore open its doors. 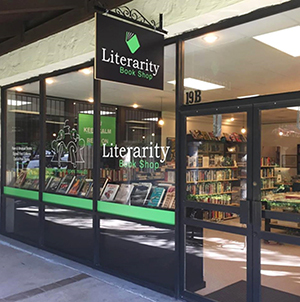 Literarity Book Shop, 5411 N. Mesa in the Peppertree Square shopping center, is the new heart of the El Paso literary scene, featuring readings, signings, and book events. Owners Bill and Mary Anna Clark describe Literarity as a place "for both serious bibliophiles and casual readers,” El Paso Inc. reported, offering “new, used, rare and unusual titles.” It's the only independent general bookstore in a city that has long needed one. The Clarks combine curation and conversation in both the store and their social media and may casually note when a collectible, signed first edition arrives or mention a shout-out to a new book or periodical, and they routinely champion El Paso authors and poets, of which there are many. 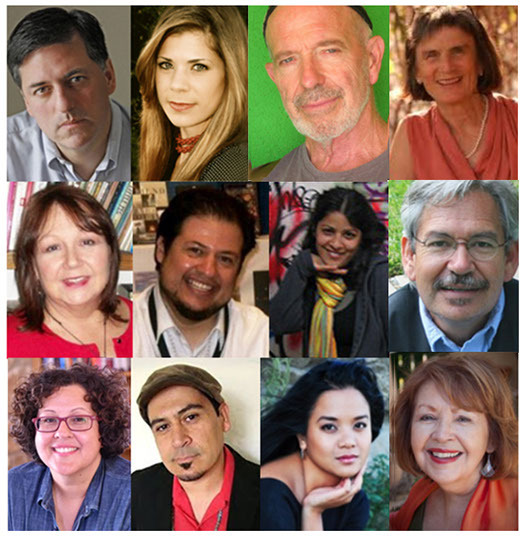 EL PASO AUTHORS >> Below right, from top left: Sergio Troncoso, Sarah McCoy, Bobby Byrd, Lee Merrill Byrd, Donna J. Snyder, Richard Yañez, Carolina Monsiváis, Benjamín Alire Sáenz, Christine Granadoz, Tim Z. Hernandez, Sasha Pimentel, Pat Mora. The city’s, and the region’s, tradition of groundbreaking literature is widely supported in individual literary pursuits and group gatherings at the University of Texas El Paso. UTEP faculty include such literary luminaries as Benjamin Alire Sáenz, the first Latino writer ever to win the PEN/Faulkner award and author of highly praised poetry and young adult novels; and Tim Z. Hernandez, a poet, novelist, and performance artist whose collections of poetry Skin Tax and novels have garnered numerous international awards. Hernandez’s newest work, All They Will Call You (University of Arizona Press, 2017), was praised by Arlo Guthrie as “a heart-wrenching read for anyone who cares” about the immigrant farmworkers among the victims of a 1948 California plane crash, a tragedy most recall from a Woody Guthrie folk song. Ben Sáenz’s short-story collection that won the PEN/Faulkner (as well as a Lambda Literary Award in the Gay Fiction category), Everything Begins and Ends at the Kentucky Club, was published in 2012 by El Paso’s own Cinco Puntos Press Novelist and publisher Lee Merrill Byrd founded the publishing house in 1985, with her husband, poet Bobby Byrd, and named the enterprise after their El Paso neighborhood. In 2017, the Texas Institute of Letters held its annual induction ceremony in El Paso, and the organization honored former El Pasoan Pat Mora with its prestigious Lon Tinkle Award for Lifetime Achievement. Mora is an acclaimed poet and author of books for adults, teens, and children. Her honors include a poetry fellowship from the National Endowment for the Arts, a Golden Kite Award, and multiple American Library Association Notable Book awards, and honorary doctorates. A former teacher and university administrator, she is the founder of the family literacy initiative El día de los niños / El día de los libros, Children's Day / Book Day (Día). The year-long commitment to linking all children to books, languages, and cultures, and of sharing what Mora calls “bookjoy,” culminates in celebrations across the country in April. She currently lives in Santa Fe, New Mexico. Among the numerous branches of El Paso’s public library system named in honor of local figures in arts, humanities, and leadership, one is dedicated to the honor of a working author from the area. 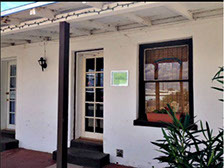 The El Paso City Council in 2015 renamed its Ysleta satellite the Sergio Troncoso Branch (9321 Alameda Ave.), after one of the city’s influential living authors. A writer of essays, short stories, and novels, Sergio Troncoso treats border issues, immigration, philosophy in literature, families and fatherhood, and crossing cultural, religious, and psychological borders. Among the awards accorded his work are the Premio Aztlán Literary Prize, the Southwest Book Award, the Bronze Award for Essays from ForeWord Reviews, the International Latino Book Award, and the Bronze Award for Multicultural Fiction from ForeWord Reviews. The son of Mexican immigrants, Troncoso was born and raised on the east side of El Paso, in rural Ysleta. He graduated from Harvard and studied international relations and philosophy at Yale, then went on to win a Fulbright scholarship to Mexico, where he studied economics, politics, and literature. He was inducted into the Hispanic Scholarship Fund's Alumni Hall of Fame and the Texas Institute of Letters. The main (downtown) El Paso Public Librarybuilding, 501 N. Oregon, is itself a mini-museum of contributions from renowned El Paso artists, including Tom Lea (more about this famous El Paso figure later). The El Paso Museum of History, 510 N. Santa Fe St., is host to more than 16,000 sq. ft. of exhibition space featuring five galleries representing 400 years of U.S./Mexico border history. The 3-D Digital Wall is a vast collection of images and videos exploring El Paso’s past and present. The museum’s bookstore offers titles on local life, history, and culture. San Jacinto Plaza, 114 W Mills Ave., has been the traditional center of El Paso since before the turn of the twentieth century. Once the home to as many as seven live alligators, the plaza’s fountain, located on the corner of Oregon and Mills, was the heart of a bustling downtown. El Pasoans came from all parts of town to enjoy the plaza and watch the alligators. 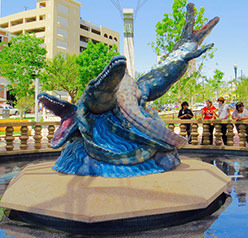 Although the city ceased exhibiting live alligators in the early 1960s, in 1995 El Paso commissioned artist Luis Jimenez to create a fiberglass sculpture, “Los Lagartos” (left); a children’s book by El Paso author Alejandra Drew also pays homage to the alligators. In a more contemporary view of the region, photographer Mark Paulda’s El Paso 120 (2014) goes beyond showcasing the scenery to make a powerful statement: “El Paso is not at the edge but instead at the very center of some remarkably amazing landscape.” Paulda takes his audience on journeys to striking destinations within a 120-mile radius of the border city. National Book Award winner and Rhode Island native Cormac McCarthy came to El Paso in the 1970s to write in “one of the last real cities left in America” and achieved both international renown a following intensely devoted to his distinctive prose But here he’s always remembered as the writer who moved to the border and retreated from the limelight, eschewing signings, interviews, and lectures. The author of Blood Meridian (1985), All the Pretty Horses (1992), and Cities on the Plain (1999) bought a one-story adobe home on Coffin Avenue in suburban El Paso that later inspired author, painter, photographer, and actor-director Peter Josyph to pose provocative, unexpected questions in Cormac McCarthy’s House about McCarthy’s work, how it is achieved, and how it is interpreted. Sixty-five of Josyph’s paintings of the house were exhibited in 1998 at the Centennial Museum in El Paso. Though McCarthy departed for New Mexico some years back, his legend thrives here. Other authors whose works capture the spirit of Far West Texas include Sarah McCoy, Leon Claire Metz, Estela Portillo Trambley Fans of historical fiction will want to delve into the 2016 saga El Paso, set in the era of Pancho Villa by Forrest Gump author Winston Groom. El Paso might seem an unlikely outpost of fine printing and book arts, but for decades during the long and varied career of Carl Hertzog, the “Printer at the Pass,” it was the source of Texas’s most prized and beautiful books. The papers of the designer-typographer-printer who taught at UTEP and founded the Texas Western Press are housed in the university’s library. A lectureship named for Hertzog continues today via the Friends of the Library. 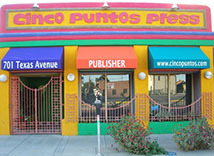 In addition to the fine work turned out in El Paso by Cinco Puntos, El Paso–based Mouthfeel Press (right, at their office in the historic San Elizario Art District) publishes and promotes poetry by new and established poets in the borderlands through an annual chapbook competition, anthologies, and community poetry readings. 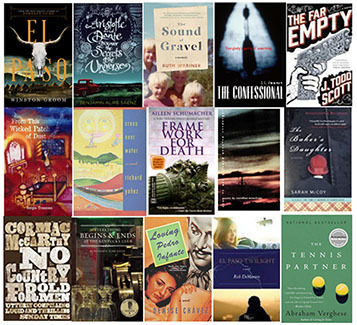 Another independent press joined El Paso’s literary scene in 2015. Veliz Books seeks quality and original literature from authors writing in English, Spanish, or Portuguese, and is also committed to publishing translations into English because they believe in cultivating artistic and literary connections that transcend geographical, cultural, and political borders. 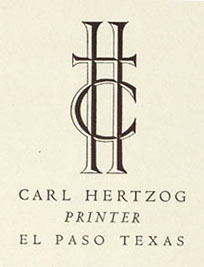 PRINTER AT THE PASS Above, the distinctive monogram colophon of Carl Hertzog graced many of Texas's finest books. Poetry and the spoken word are vital currents in the El Paso scene. 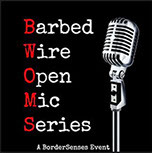 BorderSenses a nonprofit literary organization, is devoted to promoting art and literature on both sides of the border through events like the Barbed Wire Open Mic series which features performances in poetry, music, comedy, fiction, nonfiction, monologues, dance routines, and more. The Tumblewords Projectand the El Paso Poetry Project also support poetry workshops and spoken-word performance workshops. The El Paso Community College Fiesta, which occurs each year in either October or November, strives to raise awareness of literary accomplishments, recognizes those supporting literacy in the community, and works to enrich readers of every age. The 2017 Fiesta featured half a dozen authors, a poetry slam, and book fair; 2018 will mark the event’s 10th year. El Paso Comic Con (EPCON), with its slogan “Fly Your Nerd Flag High,” is set for April 13–15, 2018, at the El Paso Convention Center and will feature leading science fiction authors, the stars of the television series Star Trek: The Next Generation, cosplay, gaming and virtual reality. For an excellent selection of works by regional writers, in addition to the new Literarity Bookstore, El Paso supports two Barnes & Noble stores, one Lifeway Christian Bookstore, two used bookstores, and two comic book stores. The city is also home to the El Paso Writers League and a chapter of Sisters in Crime. After enjoying all that El Paso has to offer book lovers, you may need some refreshment. What better spot than the watering hole made famous by El Pasoan Benjamin Alire Saénz—Everything Begins and Ends at the Kentucky Club. Founded in 1920 and located in Ciudad Juarez, Mexico, the World Famous Kentucky Club, Avenida Juarez 632, Ciudada Juarez, opened two years into prohibition, and ever since has quenched the thirst for adult beverages from across the border, only a short walk from downtown El Paso. Legend has it that the legendary bar is the birthplace of the margarita. The story goes a thirsty woman came up to the bartender and wanted a something cold and refreshing. What he had on hand was limes and tequila. He made her cocktail. When she asked him what it was called, he asked her her name, and she provided it. The rest is history. When writers and authors present a reading or signing in the El Paso area, they are just as apt to cross the border into New Mexico to Casa Camino Real in Las Cruces (43 miles from El Paso), the bookstore and gallery owned by Denise Chávez, a performance writer, novelist, and teacher who lives and works on the U.S.–Mexico border corridor in southern New Mexico. Chávez is founder of the Borderlands Book Festival as well as author of The Last of the Menu Girls, Face of an Angel, Loving Pedro Infante, and A Taco Testimony: Meditations on Family, Food, and Culture. Lone Star Literary Life caught up with her by email to talk about writing, her shared culture of Texas and New Mexico, and her newest book, The King and Queen of Comezón (University of Oklahoma Press, 2014). If Denise Chavez is the queen of El Paso, letters, then native son, author, and artist Tom Lea is undeniably the king. Thomas Calloway Lea III (1907–2001) was muralist, illustrator, artist, war correspondent, historian, and novelist. The bulk of Lea’s art and literary works concern Texas, north-central Mexico, and his World War II experience in the South Pacific and Asia. Two of his most popular illustrated novels, The Brave Bulls and The Wonderful Country, are widely considered to be classics of southwestern American literature. 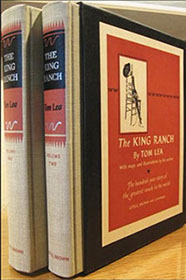 Nonfiction works like Lea’s The King Ranch preserve important chapters in Texas history. The Tom Lea Trail designated an official cultural trail in spring 2017 by the Texas Legislature, today is one of the visitable literary and cultural treasures of El Paso, connecting regional histories through art in eleven Texas cities (plus locales in Mexico and the state of New Mexico). 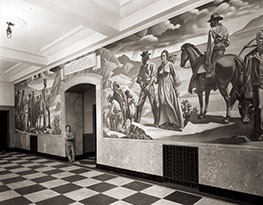 Along the El Paso portion of the trail, Lea’s art can be found at the historic federal courthouse, the El Paso Public Library, the El Paso Museum of Art, the El Paso Museum of History, and the University of Texas at El Paso. Every October is Tom Lea Month in El Paso and elsewhere. In celebration, the Tom Lea Institute and other community organizations hold exhibits, lectures, classes, film screenings, and tours throughout the month to honor his work. For one last, sweeping view of the border city, drive up Rim Road above El Paso High School to appreciate the Rio Grande vista from Tom Lea Upper Park, a haven of tranquility and lush, tree-lined paths.